Servers | KGS | "Simple2009", 9-dan returns and beats MilanMilan twice! "Simple2009", 9-dan returns and beats MilanMilan twice! Simple2009 returned on KGS after 5 months break and showed very impressive results here. He lost only one game - to roln111 (because of lag in early fuseki), but crushed KGS superstar MilanMilan twice! The first game was very simple for simple2009 - MilanMilan lost it because of very dubious joseki choice. Here is the second game. 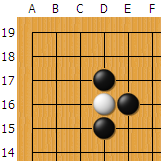 MilanMilan was ahead, after he killed some stones in early fuseki, but later he was not careful. For example, his sabaki on the right was dubious. I suggested the better way of defending that group in sgf.